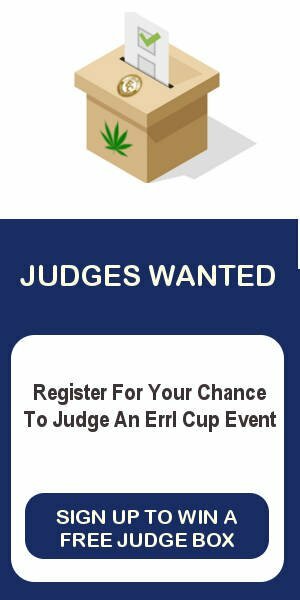 The Errl Cup Awarded to 1st Place in 18 different Categories. Results published online, on social media, and in local print. Your Dispensary receiving 1 entries into the categories your dispensary chooses. You have already or will be secret shopped 1 strain and you will also be entered into our 3 categories for Dispensary Customer Service, Knowledge and Environment. Your Dispensary receiving 3 entries into the categories your dispensary chooses. You have already or will be secret shopped 1 strain and you will also be entered into our 3 categories for Dispensary Customer Service, Knowledge and Environment. Your Dispensary receiving 7 entries into the categories your dispensary chooses. You have already or will be secret shopped 1 strain and you will also be entered into our 3 categories for Dispensary Customer Service, Knowledge and Environment. Your Dispensary receiving 14 entries into the categories your dispensary chooses. You have already or will be secret shopped 1 strain and you will also be entered into our 3 categories for Dispensary Customer Service, Knowledge and Environment. Your Dispensary receiving 28 entries into the categories your dispensary chooses. You have already or will be secret shopped 1 strain and you will also be entered into our 3 categories for Dispensary Customer Service, Knowledge and Environment. Flower: 25, 1/2 gram samples need to be separately pre-packaged with no identifying marks, labels, coatings or powders. With an additional 1 gram packaged separately for testing. With an additional 1/2 gram packaged separately for testing. Pen /Cartridge: 10, pre-filled and individually packaged vape pens with battery’s. (no identifying marks) 1, without battery to send to lab for testing. Each Dispensary in the event city will be tested with EC S.S. (Secret Shopper)Program regardless of participation. EC S.S. program is where individuals with the EC will go to Dispensaries that are participating in the EC and also the ones that are not. EC associates will purchase medication flowers, concentrates, CBD, ejuice/vapepen, and other medications that dispensary offers. These medication will be given to our team of qualified judges to be judged and they will also be given to our testing facility to be analyzed for terpenes, cannabinoids, pesticides, growth regulators mold and residual solvents. These results will be announce at the EC, and printed on EC web site, and in the New Times. Also judged for a EC Cup are Customer Service, Environment, and Knowledge of medication.